RS Components (RS), the trading brand of Electrocomponents plc (LSE:ECM), a global multi-channel distributor, has announced availability of a new series of ISOBUS circular connectors manufactured by Amphenol, one of the world’s leading makers of connectivity components for industrial engineering applications. The key application area for the ISOBUS series of cable connector sockets is in agricultural and forestry vehicles, as the series offers a standardised connection that meets ISO 11783-2. The standard specifies the physical layer for twisted, non-shielded quad-cable operating in a 250kbit/s serial data network for control and communications between agricultural or forestry tractors and machinery and their implements, whether these devices are mounted, semi-mounted, towed or self-propelled. A key feature of the series of nine-pole cable-mount circular connectors is its two size 8 power contacts for 6, 10 and 16mm2 wire gauge. 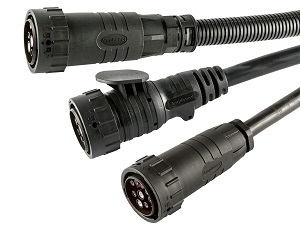 Offering rapid and secure assembly, cable connector variants in the series also include field-installable devices, as well as over-moulded cable assemblies. Rated for 24V operation, the series also meets IP67 and IP69K ratings to protect against water and dust ingress. To complement the series, a selection of dust caps is also available from RS. The ISOBUS series of Amphenol circular connectors is shipping now from RS in the EMEA and Asia Pacific regions.